Can You Ever Forgive Me? 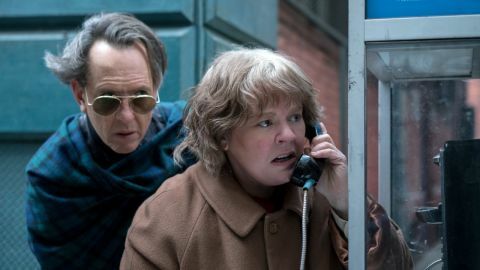 review: "Melissa McCarthy is a dowdy and determined revelation"
The powerful, vanity-free performances are the real thing in this bittersweet biopic. Swapping her trademark pratfalls for literary crime and daytime drinking, Melissa McCarthy is a dowdy and determined revelation in this engaging true-life tale of author Lee Israel’s audacious ’90s scam. Don’t mistake director Marielle Heller’s rich, melancholy character study, however, for a Life of the Party-style middle-aged makeover movie. McCarthy’s caustic Lee, a penniless celebrity biographer with a toxic personality, can’t catch a job or a break until selling a showbiz thank-you reveals that there’s big money in famous people’s letters. Soon she’s a one-woman forgery factory, creating hundreds of fake missives from Noël Coward et al on old typewriters and oven-aged letterheads. Enlisting broke grifter Jack Hock (a barnstorming Richard E. Grant) as her fence morphs the movie into a funny-sad buddy caper, complete with archive heists and blackmailer booksellers. Jeff Whitty and indie queen Nicole Holofcener’s tack-sharp script is nicely nuanced about gay mid-life loneliness and last chances, with Heller wrapping a smoke-stained ’90s New York of dingy bars, bookstores, and chilly streets around the pair. The real delight, though, is in McCarthy and Grant’s bitingly rude and funny fraudsters, two cynical losers finding refuge in one another. Grant injects a mix of charmer and rotter into Jack’s hustling, but it’s McCarthy’s prickly, vulnerable and bravely egotistical Lee who seals the film’s deal.